The Fettlers consists of Peter Bate, Mike Lane, Chris Pemberton, Fritz Risler, Tony Suttor and Pat Somers, all of whom have been associated with the Top End Folk Club for many years. The songs are focused on the North Australian Railway which ran from Birdum / Larrimah to Darwin until it closed in 1976. 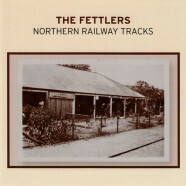 The Friends of the North Australian Railway are dedicated to preserving the heritage associated with the Top End’s first railway and prompted the production of the CD.